Contemporary training technology allows peaceful animals to be turned into actual fighting machines. The growing interest in these animals among the military is completely understandable: Given appropriate training, “man’s best friends” can cope with the sort of combat missions that no soldier is able to take on. The Russian Ministry of Defense has decided to expand the practice of using animals to carry out combat missions. Just this year, following a decree from Defense Minister Sergei Shoigu, more than 400 recruits were sent to train in one of the most unusual specializations in the Russian armed forces—as handlers for guard dogs and mine-detection dogs. Moreover, in total, around 300 four-legged soldiers already serve as guard dogs at military sites or are engaged in work linked to explosives detection. Service dogs are behind a significant proportion of the mines and other explosive devices discovered by the military. However the military would prefer not to elaborate on precisely how many explosive devices are found or how many four-legged sappers are killed in the process. In Nikolo-Uryupino (not far from the Moscow Ring Road), there is a secret, cross-species training center that trains specialist sapper dogs. Here, unique technology is used to train these dogs, allowing them to be guided remotely: A video camera and communications device are attached to the dog, and the handler communicates with the dog via a radio-link. Usually, however, for a dog to understand its owner, it needs not only to hear them but also to see them. Aside from this know-how, special body armor has been developed at Nikolo-Uryupino for these dogs. Specialists claim that the specific “fit” means the movements of the four-legged soldier are not hindered, and this allows the dog to carry out any type of work. It has been proposed that this body armor be used in counter-terrorist and other special operations. The Russian trainer Vladimir Durov, who is still well-known, first developed the practice of using animals for military purposes. He conducted the first experiments in training dogs to carry out military missions in 1882. 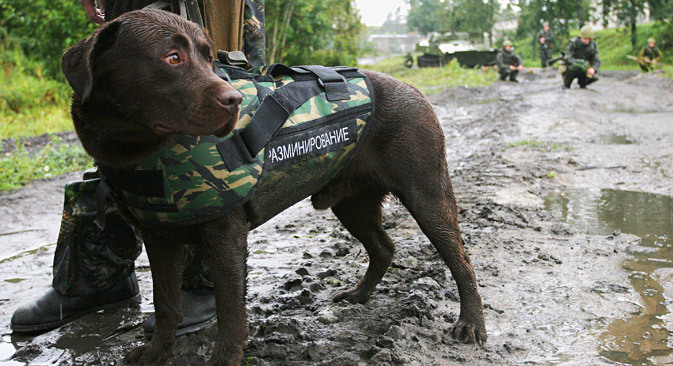 Dogs however are not the only animals in service with the Russian army. The Murmansk Institute of Maritime Biology is engaged in work that is no less important: A training center has been set up based on this institute to train sea animals. Today there are 15 “soldier seals” in the special forces of the Russian Federation that come under the patronage of the Northern Fleet. They are few in number, but, in the long term, this is enough to reliably guard strategic nuclear submarines, for example. Gennady Matishov, a scholar at the Russian Academy of Sciences, says that the seals’ potential is useful in carrying out a range of missions, both on land and underwater. This is, however, especially important when it comes to submarines, where human potential is restricted. For example, it is normal for a seal to dive to a depth of 330 feet, while this is a serious test and potentially life-threatening for a human. Apart from this, a seal is able to detect objects and remove them, bring tools down to a diver deep underwater, and, when necessary, even kill an enemy. Just like ordinary soldiers, the seals are on seasonal combat duty close to the vessels. In contrast to humans, however, seals are not susceptible to the capricious northern climate. Cold, snow and ice do not have any effect on their quality of service. The former commander-in-chief of the Northern Fleet, Vyacheslav Popov, explains how exercises took place under his leadership: Navy saboteurs were ordered to break into the nuclear submarine base undetected and mine the submarines. The navy soldiers, though, were not warned what they would be up against. Literally just a few minutes after the seals were released from their enclosures and set off into the gulf, all the saboteurs surfaced and made a dash for the shore. Even the courage of trained soldiers from the elite special divisions in the Russian navy was no match for sea animals in their natural environment. It has to be said that the Ministry of Defense prefers not to comment on programs linked to training animals to carry out combat missions. Statistics concerning expenditure on these objectives are highly classified, and it is not possible to gain access to either Nikolo-Uryupino or the Northern Fleet’s seal base.